to turn off everything with an "on/off switch." I'm a technology addict [see: phone, cameras, cameras in phones, laptops, & everything within these products like the Internet, apps, so on and so forth] and the two or three or fifteen hours on a plane when I can shut myself out from all of that and just stare out the window at fluffy clouds, listen to some music, write and read magazines, and just get lost in my thoughts is time that I cherish. Today, for a writing project, I turned off all technology for the whole day. I was so excited about getting to engage in real conversations and to sit in a sunny spot and journal. I was excited to take actual handwritten notes in class. I was ready to get up at the crack of dawn and go running without music or mile trackers, to have a meal without the distraction of constant buzzing, to read a book and rest my mind and all that. It's not as great as it sounds. I mean certainly, I enjoy time off from technology. I like going to a coffee shop and journaling and reading books and all that... but it's really different when you are actively restraining yourself from checking your e-mails. With the conscious knowledge that you can't do something... it's kind of awful. On an airplane, everyone has their electronics off. In everyday life, well, it's kind of just you because you had this bright idea to do so. It's important to have quality "unplugged" time. because sometimes those are the really good things in life too. So true, you think it's going to be better without technology, and when you're without it that's all you think about. I need to get out of that rut too. Cheers to carrying our phones around us less! Oh I know. I love my internet time, and friends. I think you can feel it in your gut when you need a break, and then take a break, and then move on. 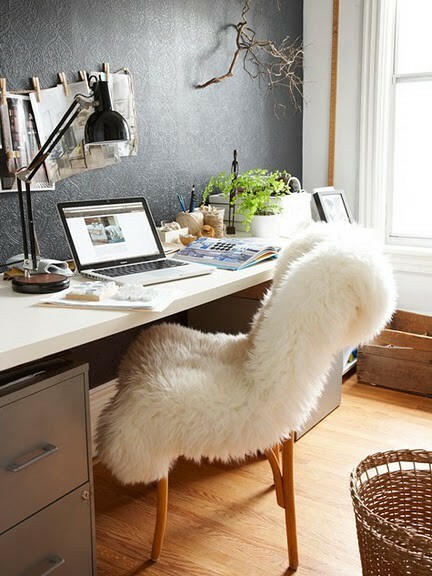 Love the image, I want a fuzzy chair! I definitely have to better at getting "unplugged" for sure. For me I'm attached to my phone 24/7! i definitely enjoy those tech free moments as well, sometimes it gets a bit annoying when everyone around you is constantly plugged in. but i'm also super dependent on technology too! I also love the tech free moments, I always devour them when I'm at the airport or in new surroundings because I think it might go off or something..I like the picture the work area is very cool & chic! I agree! Taking a break from technology and the internet is absolutely necessary! Can't strain your eyes in front of the computer all day long! Ain't good for the body either! Ahh, my boyfriend gets mad at me all the time for Instagram..I definitely think I need to unplug once in a while as much as it pains me to!! I applaud you for having the restraint to turn off all of your technology for a day! That would drive me nuts! I agree with you though, it's nice when you can just be unplugged on airplanes without having to worry about it. Getting lost in your thoughts is a nice break from being filled with other people's thoughts through technology and text messages. i make a point when i travel to have no technology on if possible. i never realized how addicted to it i was until i didn't have it. you are so right.. airplane time is like great time to catch up on reading, sleep, writing... whatever! It's crazy how so many people (including me) are seriously addicted to technology. I can't even imagine what the future will be like!